Hi, I'm Richard Abela, the CEO of Oldfields and this is Marios Rivera, the General Manager of Scaffolding. We’re really pleased and proud to be here today at the Kennards event on the Gold Coast and the great opportunity to meet all the team. 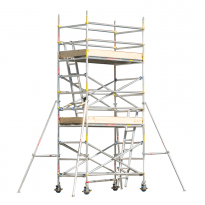 Today, we're talking about 2600 Scaffold, this is not a new product to the Kennards family. What is new about this is there is our Weesa decks, these decks now are new and have a longer lifespan. We’ve now given a two-year guarantee on these decks and so that will give the longevity to the decks that we so desperately need. Probably one of the easiest scaffolds in the market to erect and dismantle. Very simple componentry and this is why it's so popular across the whole range of scaffolding in amongst all Kennards branches here in Australia and in New Zealand. Yep, the second new product that we’re talking about today is our Safety Platform. This is a probably brought out to test the market with, as ladders become less and less popular and from a safety perspective, this is a new opportunity to talk about safety in the workplace. And this is now 1.8, it can also come in 2.4 and 3.6. So, a great opportunity to test it as amongst the guys in the Kennards family. To hire any of these equipment, please feel free to contact your Kennards branch or visit the Kennards website. Aluminium 'double width' towers used mainly for maintenance and construction on residential, civil and construction sites. Assembled on site. 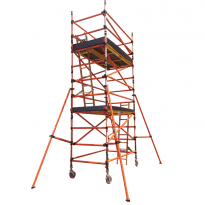 Double width is suitable when a larger work platform is required. Fibreglass scaffold in a range of sizes. With every frame able to be used as a base frame it can be erected in minutes. Super light making it easily transportable by small truck, trailer or ute. 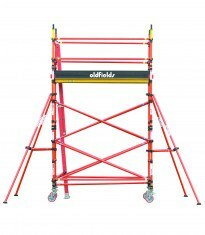 Double width is suitable when a larger work platform is required. Assembled on site. Fibreglass scaffold in a range of sizes. With every frame able to be used as a base frame it can be erected in minutes. Super light making it easily transportable by small truck, trailer or ute. Assembled on site.